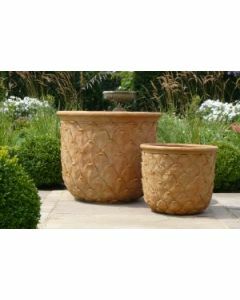 This lovely ceramic garden planter features a cup design with a salmon glaze finish. The planter comes as a set of two. The small measures 17" in diameter X 18.5"H and the large measures 24" in diameter X 25"H. Click on image for greater detail.